The Porta Brace CS-DV4 Mini DV Camera Case with QS-M4 Mini Quick Slick (Signature Blue) is designed to protect and organize the camera and the essential spare battery, tapes and microphones. It fits popular cameras such as the Sony PMW-EX1, HVR-V1U, HVR-Z1U, HDR-FX1, Canon XH-A1, XH-G1 and the Panasonic HVX-200. The cradle inside is adjustable and stays put to keep the camera from shifting. The case is made from 1000 denier Cordura nylon with a generous coating of polyurethane waterproofing, plus 1.0" thick foam padding. The bottom panel is reinforced with 8.0mm hollow core plastic, foam layers and a layer of Slip Not fabric, which adds an extra layer of protection against water, dirt and grime with an easy wipe-off surface. 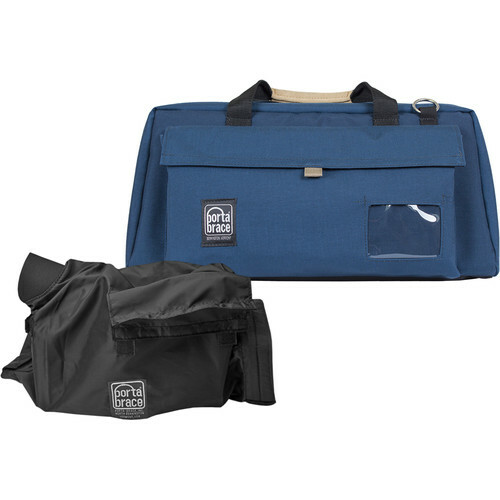 The CS-DV4U/QS-M4 has a large exterior pocket for cables and an optional rain cover, a wide slip pocket for white balance card, owner's manual, maps, airline tickets, etc, and one small padded soft pouch. The case is carried by a removable adjustable suede shoulder strap or dual suede carrying handles. The signature blue with black string CS-DV4 Mini DV Camera Case from Portra Brace is designed to protect and organize the camera and the essential spare battery, tapes and microphones. It fits popular cameras such as the Sony PMW-EX1, HVR-V1U, HVR-Z1U, HDR-FX1, Canon XH-A1, XH-G1 and the Panasonic HVX-200. The cradle inside is adjustable and stays put to keep the camera from shifting. The case is made from 1000 denier Cordura nylon with a generous coating of polyurethane waterproofing, plus 1.0" thick foam padding. The bottom panel is reinforced with 8.0mm hollow core plastic, foam layers and a layer of Slip Not fabric, which adds an extra layer of protection against water, dirt and grime with an easy wipe-off surface. Box Dimensions (LxWxH) 22.0 x 12.0 x 11.0"
Box Dimensions (LxWxH) 12.0 x 12.0 x 2.0"